Like any business, dental practices may need to make focused efforts on their patient experience in order to ensure they’re delivering quality customer service and retaining happy patients. Unfortunately, customer service strategies may not be a big focus for dental schools. Great customer service is something dental professionals may have to learn on their own, through experience. And while amazing patient experiences may come in many different forms, the right strategies for your practice may be completely specific to you and your patients. From text message and email appointment reminders to a range of electronic payment options, consumers of all types may appreciate the convenience of modern, streamlined services. At the very least, you may want to offer the same payment and scheduling options as your competition. If you can, consider going even further. For example, consider accepting smartphone app payments like Apple Pay and including an online payment portal accessible on your website. TLDR: Find and integrate modern technology into your payment and scheduling processes. It may be much easier for patients to stay loyal to your dental practice if they feel like they have an established relationship with you and your staff. You may not have to know the details of each patient’s lives, but by taking a few notes each visit, you may be able to remind yourself of previous conversations. Consider calling each patient by name, then using your notes to ask about their families, school, work, children, new car, travel, anything they may have mentioned before. Even though you may need a little note to jog your memory, conversations about more than the weather may be exactly the kind of authentic interactions that help to build trust and brand loyalty. TLDR: Use notes to remember patient details and help yourself to have real conversations about what matters to them. Think about some memorable amenities you could offer to enhance the client experience. Not every amenity will impress every patient, nor is every amenity practical for every practice. Think about the amenities that may “wow” your patients specifically, whether they include a “comfort cart” of various items for anxious patients or toys and games for children, find amenities that fit your specific niche. TLDR: Amenities chosen for your specific patient types may make their experience more memorable and pleasant. A quick phone call to your patients after major procedures may go a long way to show patients how much you care. Imagine being a patient that’s spent the morning having a root canal, getting braces or another major procedure. Later in the day, they could be experiencing pain, discomfort, or everything could be fine when their dentist personally calls to check on them. If they have questions or concerns they may get answers immediately. Either way, they may feel like their dentist is personally invested in their well-being. TLDR: Consider contacting your patients by phone, a few hours after major dental procedures. One of the best ways to improve customer service in your practice may be explaining more and listening more. 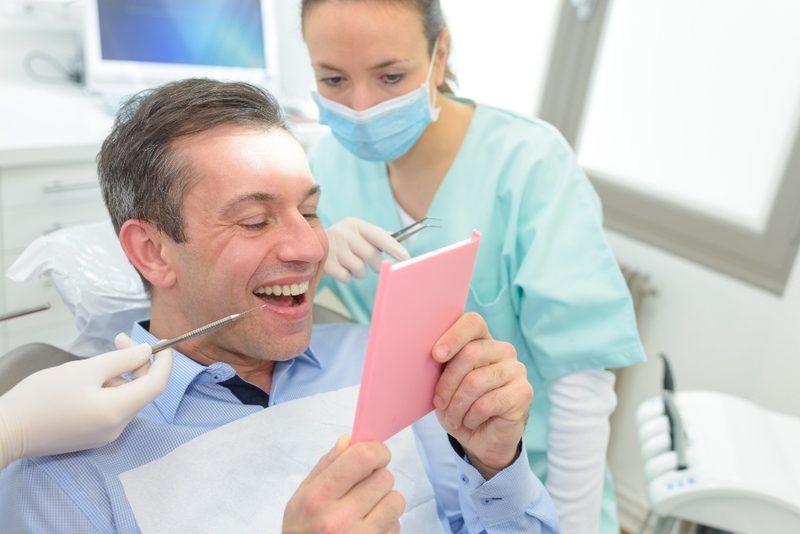 Since dentistry may induce anxiety and fear, being more open with your patients may be a real benefit to both of you. Consider having front desk staff give new patients a tour of your practice. Then, for regular visits, try to communicate, openly and honestly, during every aspect of the experience. Ask frontline staff to give patients wait time estimates when they check in. Ask your dental hygienists to explain exactly what they’re doing and why, even explaining the different tools they’re using. Look for opportunities to give your patients informed choices in their care as well, when you can. TLDR: Keep patients informed and involved by explaining your practice and procedures. It may be tough to listen to your patients without an easy way to do so. Consider creating a system of collecting and reviewing patient feedback about your dental practice. Consider creating a way for patients to give you open, honest feedback about their experiences, such as a Yelp page, a Google My Business listing, an email address for suggestions or concerns or even a suggestion box in your waiting room. Then, share it with patients, encourage feedback, make someone on your staff responsible for the program and be sure to address concerns in a timely manner. TLDR: Create a way of collecting and reviewing honest patient feedback. Keeping your practice clean, organized, courteous and efficient may seem like obvious foundations of good customer service, but these practices may not always be consistent everywhere. Before you add any amenities, technology or alter your policies to be more patient-friendly, take a hard look at the base experience of your practice and be sure it’s working well for everyone. Consider the speed and accuracy of your billing, patient wait times, the appearance and demeanor of your staff, the cleanliness of your office and even the proximity of patients to private conversations among your staff. All of those may be major factors in your patient’s satisfaction. TLDR: Be sure your practice is timely, organized, clean and professional as the foundation of good customer service. No matter what specific strategy you choose, the best way to start making your patients happier may be by understanding who they are and what they want. Before you begin introducing changes to your practice, consider surveying a portion of your patients, creating patient personas or brainstorming with your staff to find some of the most effective ways to focus your efforts. Remember to consider the whole journey of your patients and let their needs lead your actions. Treloar & Heisel, Inc. and its divisions do not offer legal or marketing advice. Please consult a legal or marketing professional for any issues concerning these topics.